Integrated Bioscience Ph.D. student Rafael Maia is leading research on raven feathers that could benefit production of glossy materials. Photo by Robert Montgomerie, Queen's University. University of Akron Integrated Bioscience Ph.D. student Rafael Maia, along with postdoctoral researcher Liliana D'Alba and assistant professor Matthew Shawkey, have learned that black birds really are of a different feather. 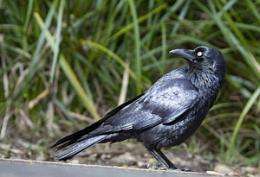 In research supported by the U.S. Air Force Office of Scientific Research, the UA team discovered that the shine of some black feathers, like those of ravens, comes from a unique arrangement of nanometer-scale parts. The finding provides possibilities for new ways to produce glossy surfaces. Typical iridescent feathers have a single thin layer of keratin atop a linearly organized layer of melanosomes (cell subunits that contain the light-absorbing pigment melanin), while matte black feathers have a thick keratin layer and disorganized melanosomes. The researchers discovered that shiny black feathers have a single thin keratin layer, but only loosely organized melanosomes, putting them somewhere in between matte and iridescent. This structure may represent an evolutionarily intermediate step between matte and iridescent colors, notes the journal Proceedings of the Royal Society B, in its Dec. 1, 2010, release of this research. 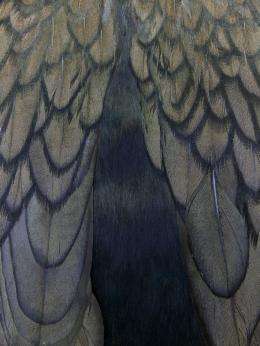 Shiny black feathers have a distinctive nanostructural basis than other fully iridescent feathers like one sees in starling or pigeon neck feathers, Maia says. Maia explains that the colors in iridescent feathers result from the interference of light as it moves between extremely thin layers of material on the feather surface. Think of the rainbow-like hues created by oil and water, Maia describes. The glossy black feather, however, incorporates a thin film that is not formed fully enough to create color, but enough to create a distinct shiny, or glossy, appearance. This half-baked film, as Shawkey describes it, also is significant because it may provide inspiration for new ways to produces glossy materials. Gloss is typically achieved by increasing the smoothness of a surface, for example by polishing it.